Of course, motherboards based on the AMD 800 series chipsets will be the bulk of reviews in the near future. But let's make an exception for this relatively new Gigabyte solution, GA-770TA-UD3. The model is based on the AMD 770 chipset, but it's quite interesting for its target audience nevertheless. The idea behind the motherboard becomes clear at first glance. The only graphics slot, 4 PCI slots available even with a dual-slot graphics card installed, legacy interfaces like COM, LPT, FDD. In other words, GA-770TA-UD3 is intended for a conservative user who only has one graphics card and doesn't need integrated graphics, and who's going to continue using legacy periperals he or she has. 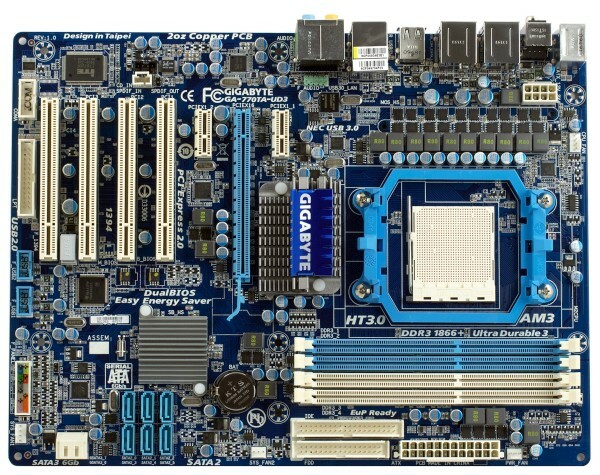 Other companies offer similar products as well -- motherboards that support both up-to-date CPUs (including hexacore in this case) and legacy peripheral devices. So Gigabyte decided to stand out by also offering a set of the newest interfaces, SATA 6Gbps in particular. The back panel features two blue USB 3.0 ports, as well as FireWire connectors of both types, a couple of eSATA (provided by a standalone controller, so you have the full amount of chipset SATA ports). Another nice feature is optical and coaxial S/PDIF connectors. It seems like the company is trying to please as many users as possible, and the motherboard itself is kind of unique. Obviously, carrying features like these, the motherboard isn't going to be very cheap. But users looking for models based on AMD 770 hardly want to pay a lot. So Gigabyte decided to save a bit on the cooling system. The Northbridge is covered by a rather compact heatsink, the Southbridge has a plate with barely noticeable fins, the MOSFETs don't have heatsinks at all. Well, that's still acceptable, because the chipset without a graphics core doesn't heat up much. Even if the chip will get hot to the touch in a compact PC enclosure, it should work fine, because its temperature range meets the requirements of embedded and industrial solutions as well. The uncooled MOSFETs, however, will surely be a disadvantage, if you want to overclock some high-end CPUs. But that's something this motherboard isn't intended for anyway. The CPU VRM is luxurious for a mid-end motherboard. It has 10 phases, 2 highly efficient Low RDS (on) MOSFETs per phase, and ferrite-core chokes. There are 11 x 820µF and 3 x 270µF capacitors, all solid, made by leading Japanese manufacturers. GA-770TA-UD3 also has twice as thicker, copper voltage and ground planes. Processors with up to 140W TDP are supported. 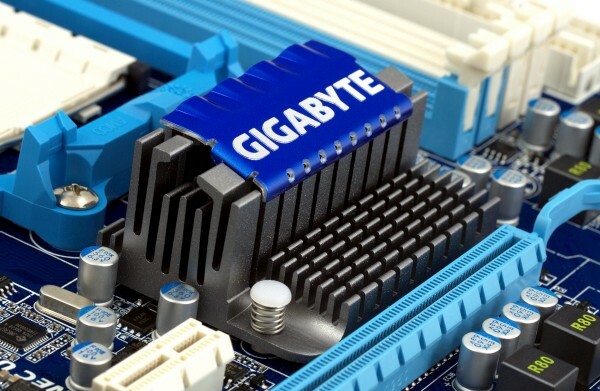 Gigabyte also provides two flash chips to help you, if firmware update goes wrong. 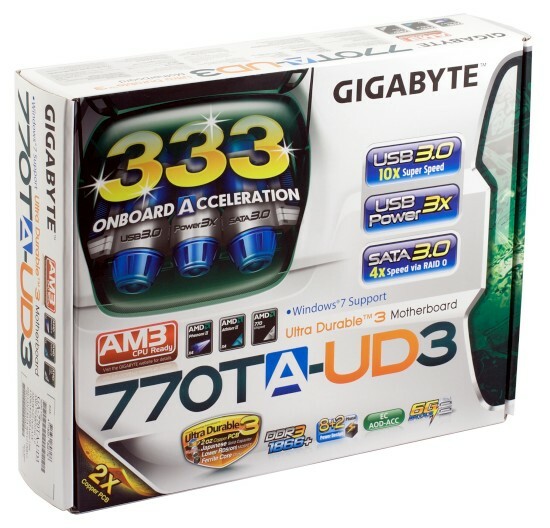 (Only the cheapest motherboards of the company have a single chip that has BIOS backup stored in a secure partition. The bundle includes two L-shaped SATA cables with metal latches and a brief assembly guide. Software includes EasyTune (monitoring, fan controls, etc. ), Face-Wizard (BIOS splash screen editor), Q-Share (LAN file sharing), @BIOS (BIOS upgrade with automatic search). Third-party software includes Norton Internet Security. System monitoring based on ITE IT8720F; BIOS offers fully automatic CPU and system fan speed control (manual controls available in Easy Tune); both 3-pin and 4-pin fans are supported. We assessed the integrated audio solution in the 16-bit/44kHz mode using RightMark Audio Analyzer 6.2.3 and an ESI Juli@ sound card. Overall grade: Very good. The result is close to the best possible for this codec.